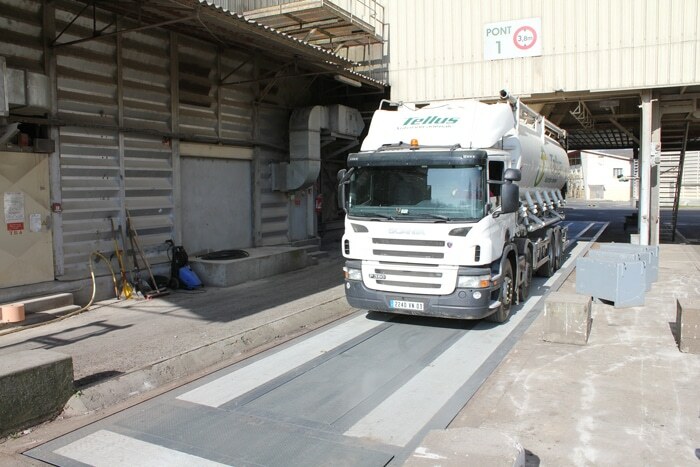 TELLUS NUTRITION ANIMALE GETS EQUIPPED WITH A 36-METER WEIGHBRIDGE! In only 3 days, PRECIA MOLEN has replaced an existing weighbridge by a new concept of 36 meter-long weighbridge on just 8 load cells for the livestock farming food production site of the TELLUS NUTRITION ANIMALE group in the Auvergne region. This large-scale operation started from the Friday with the removal of the existing weighbridge, to then set up the new one without modifying the civil works pit and finally to calibrate and commission the weighbridge so that the site could resume its operations on the following Monday morning at dawn. turns with perfect coordination to TELLUS NUTRITION ANIMALE’s huge satisfaction. concrete and the main steel part is removable to ease the cleaning of the pit. The filling of truck crates is performed via a PRECIA MOLEN metrology system, whichever the position of the vehicle on the weighbridge. The total weight loaded by the PLC must be compliant with the set point that meets customers’ requirements as well as road regulations.